The original Cars movie came out in March 2006. That may not seem like all that long ago to some of you, but keep this in mind: it wasn't until September 2008 that the first-ever Android phone, the HTC Dream, made its consumer debut. Back in '06, I was just a kid who was much more interested in toy cars than technology. You can imagine, then, how excited I was to see a Pixar movie with animated talking cars. It's been eleven years since then, and I now spend my time on actual cars far more than little models of them. 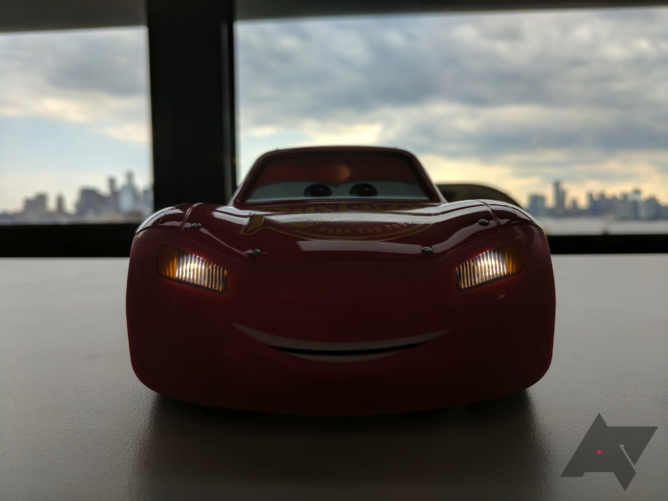 But with Cars 3's recent release, Sphero unveiled a realistic, technology-packed 'Ultimate Lightning McQueen' RC car. Given my love for both cars and technology, I knew I had to have a look. Unfortunately, despite all of its nice little touches, it didn't live up to my expectations, especially given its monstrous $300 price tag. 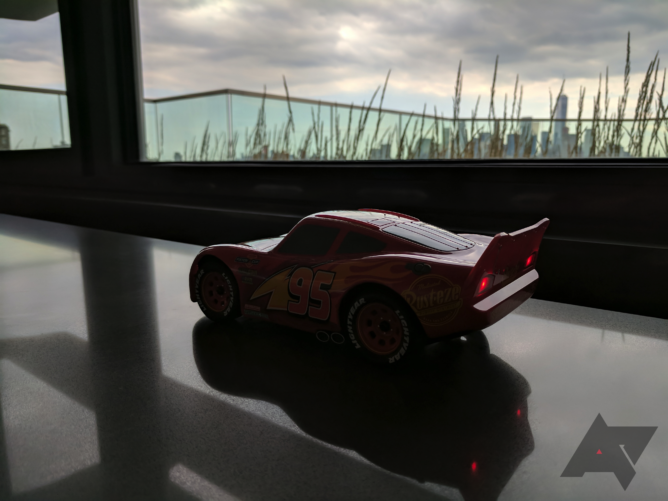 I have to give it to Sphero and Disney here - Ultimate Lightning McQueen is extremely realistic. The proportions are correct, and the details are all to scale. 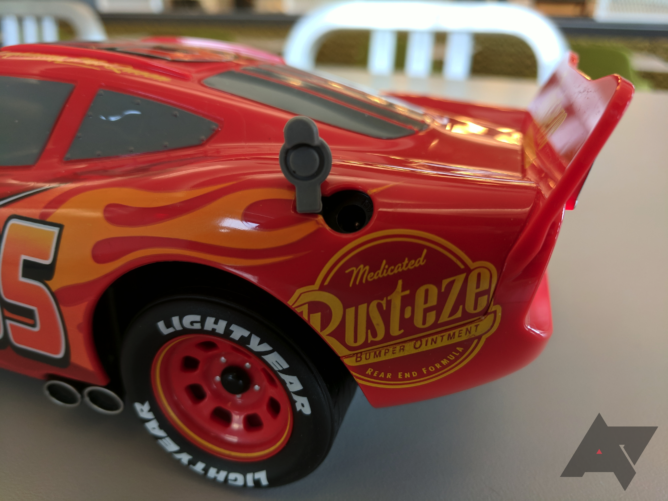 Everything from the accurate, high-quality decals (they're not stickers!) to the staggered red wheels give the impression of quality. 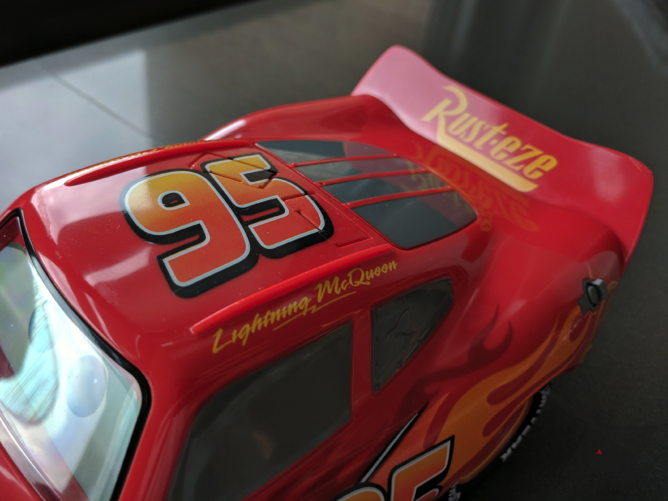 My personal favorite touch is how the car's charging port is hidden beneath McQueen's rubber gas cap, which is both clever and functional. 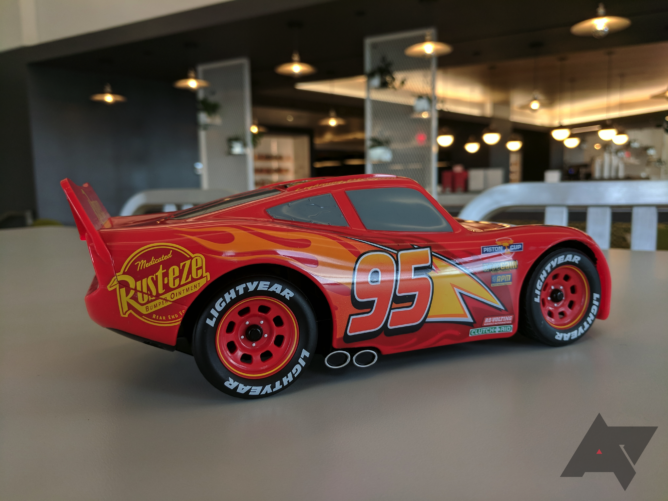 This is probably one of the most detailed Lightning McQueen scale models you'll find out there, even though it's an RC car first and foremost. In fact, the only thing that would prevent it from being passed off as a legitimate model is the nonexistent eyes when it's turned off, since the eyes are actually a trapezoidal display (an impressive feat). 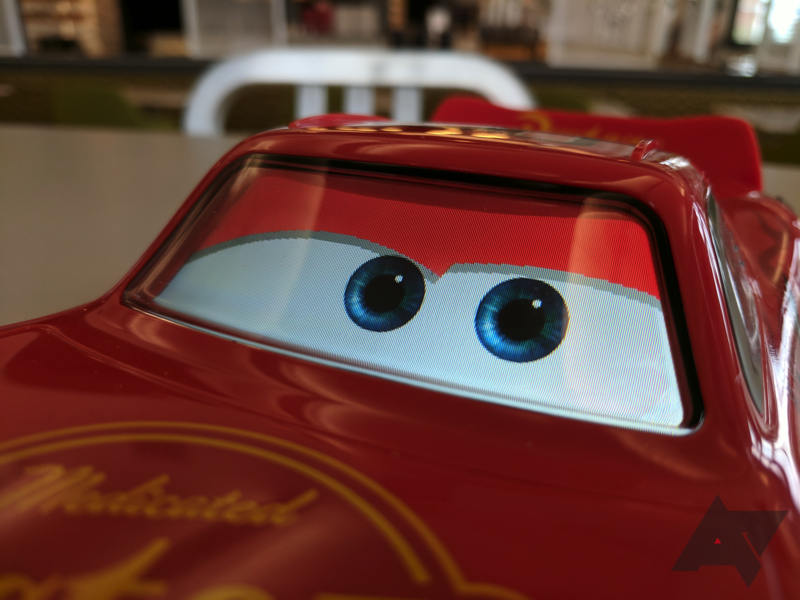 But if you really wanted to, you could just reinstall the sticker of McQueen's eyes whenever the car isn't being used. The car is also pretty durable. I ran into all sorts of obstacles while driving this thing around, and it still looks virtually pristine. I even drove it off a table about three feet in the air, after which it landed upside down. I legitimately thought that I might have broken something important, but the only marks left behind were a little dent on the rear spoiler and a scuff near the eyes/windshield. The silicone front bumper for the animatronic mouth is responsible for some of this, even if it does fade a bit when it gets dirty, but it can easily be cleaned up. If you look closely, there are a few extraordinarily light scuffs around the car, but that's about the extent of the wear and tear. My only real gripes with the exterior are the lack of a battery indicator and the lack of a power button. The battery level can be seen from within the app, but that's not really useful if you're trying to gauge if the car is dead. 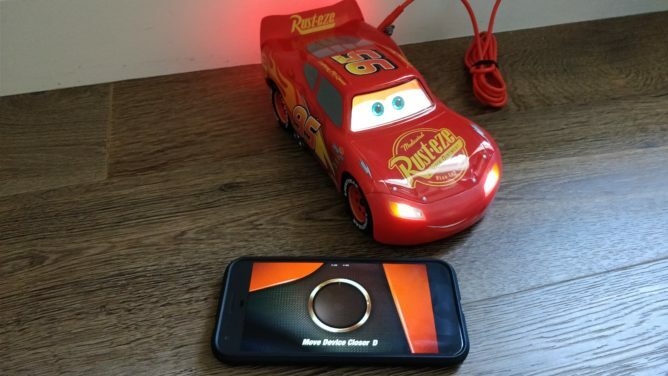 And while the Bluetooth LE method of just placing the phone near McQueen works most of the time, the car sometimes refuses to turn on, even if there's adequate battery, until you plug it in. A power button would really come in handy here. Given the price, this car's main selling point is quite clearly all of the various gizmos and gadgets inside. In total, there are six motors: one for the animatronic mouth, two for the 'emotive' suspension (lifting the car up and down), two for the front wheels (the actual power), and one for steering. There are also five touch panels (roof, hood, both doors, and rear). And of course, there's that aforementioned display for McQueen's eyes. This all works quite well - the car leans itself around as it speaks with its moving mouth, making it seem pretty lifelike. The touch panels are rather useless, though; the car simply moves around when they're activated. Light sensors allow the LED headlights and taillights to adjust based on the amount of lighting in the room. I didn't really notice the taillights getting any brighter or dimmer in different lighting situations, but that's likely just because it works well. The headlights do turn on if it gets dark, and back off if the car detects light again. This takes a while to do, but it's not as if anyone is actually going to drive a $300 RC car around in the dark. There's also a very loud, clear speaker on the car. Trivial as it may seem, this is actually a pretty nice addition, considering how Sphero's BB-8 didn't have one and was forced to use the speaker of the device it was connected to (that just ruins the experience). Luckily, there are volume controls in the app if you don't want to disturb the rest of your house with the sound of Owen Wilson's voice. Given that this is a remote controlled car, the driving aspect is pretty important. Unfortunately, despite the realism of the rest of the car, piloting it around my house proved rather cumbersome. 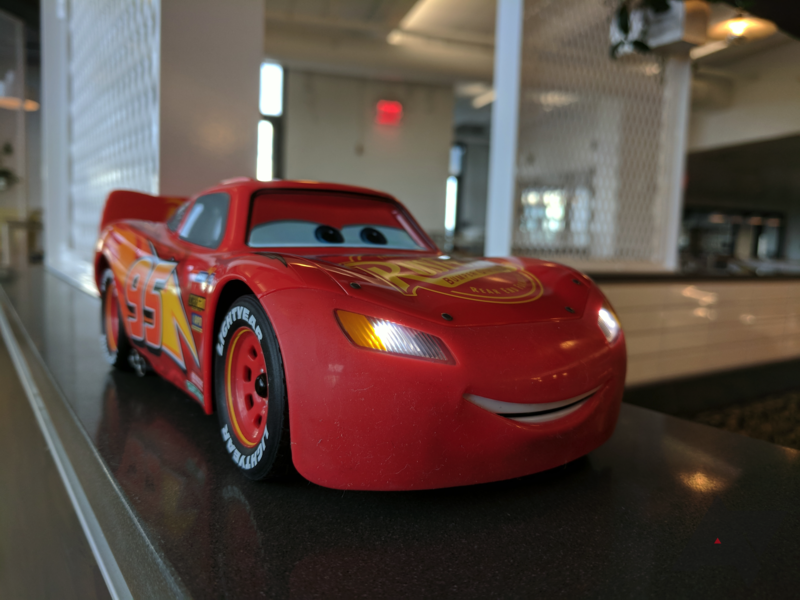 Turning McQueen on is pretty easy, even if it does take longer than it should sometimes. Just open the app on your phone, move it close to the car, and the car will slowly turn on. It'll then check for updates, and if there's an update available, it'll automatically download it. It's probably wise to make sure WiFi is on any time you boot this thing up. When that's done, you can hit a big "START" button and enter the app. The controls are, unfortunately, not intuitive at all. There's a joystick with three large buttons on the right side and a small one on the bottom left. The first time I tried to drive around, I was completely unable to get the car to go in the direction that I wanted it to go. After a few minutes, I figured out that the designers had made the controls based on where you're positioned relative to the car. In other words, if I'm standing behind the car and I slide the joystick upwards, the car will go forward. But if I'm standing in front of the car and I do the same thing, it'll do a 180 and head in the other direction (the direction I'm looking towards). The joystick's controls change depending on where you are. Sphero probably thought this would make the driving more engaging, but in reality, it just complicates things. Conventional RC controls are easy enough to understand, so implementing this was definitely a mistake. Because of this, almost every time you start playing, you have to hit the little button on the screen to recalibrate the car; otherwise the controls will send it in completely random directions. Plus, to reverse, you have to hold one of the buttons down while moving the joystick around. Seriously, what exactly was wrong with the normal forward-backward-left-right controls? The car would be easier to drive, you wouldn't have to recalibrate it every time, and you wouldn't need a dedicated button just to back the car up. I'd love to be able to say that the car is a blast to drive once you learn the controls, but I can't. The motors are actually fairly powerful, but the car is so heavy from all the hardware on board that it can only go up to around 6 MPH. The power is sent to the two front wheels so that the car drifts more easily, but it just ends up sliding around far too much. Move your finger too far left or right on the joystick, and McQueen will just keep drifting around. There's even a button for donut mode, which is completely unnecessary given how little grip the rear tires have already. There's also a button to boost the top speed, but given how slow the car is, it doesn't do much. 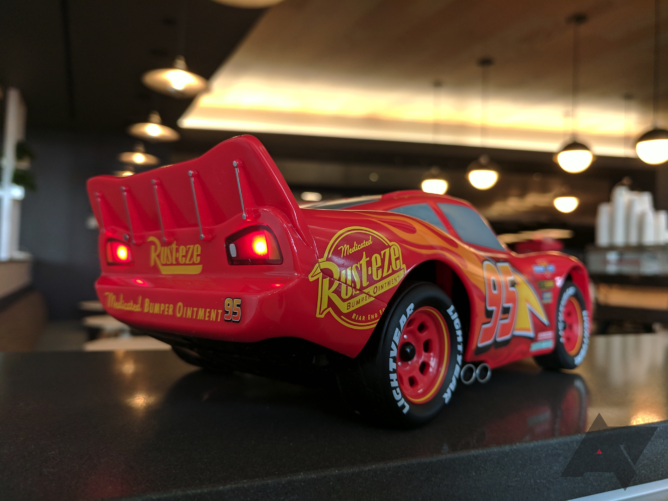 We can all agree that range is something that's rather important with RC cars, right? Sadly, it's dismal on this one. Sphero advertises 30 meters, but I was only able to get around 7-8 meters away from the car before I started getting an error message. To be fair, this thing isn't intended to drive far away or speed around, but if you're driving in a large house (which you might have if you can swing $300 for a toy car), you'd better follow it around. I did find the claimed 40 minute running time to be pretty accurate, though. Virtually the only upsides of this car once it's turned on are the noises and motions it makes. While it sits there, it'll shift around like the real thing, and if you leave it sitting too long, it'll impatiently say things like "Come on, let's go!" or "Uhh... I'm gonna fall asleep if we don't start soon." While reversing, it'll say "Beep! beep! beep!" Picking it up off the ground will make it say "Whoa, where are we going?" and turning it upside down will cause a "Wha- who turned your garage upside down?" Leave it sitting for too long, and it'll say "I feel a power nap coming on..." and turn off. You can force it to talk by pressing a speech bubble in the app, but you have no control over what exactly it says. Lightning comes with a couple of gimmicks, as well. "Pit Stop Panic" is a game where you slide things like gas and tires to racecars as they come in for pit stops. It was more fun than I expected, but it's not something I'd turn the car on for just to play, as it doesn't really involve the RC car aside from it saying some phrases of encouragement here and there. The "Acting Studio" allows you to arrange a long list of different sounds and movie phrases by McQueen, and then play them back in whatever order you put them in. left: Pit Stop Panic. right: Acting Studio. And lastly, the "Drive-In" is supposed to make McQueen react to his own movies. The car does have to be plugged in, which makes sense given the length of the movies. 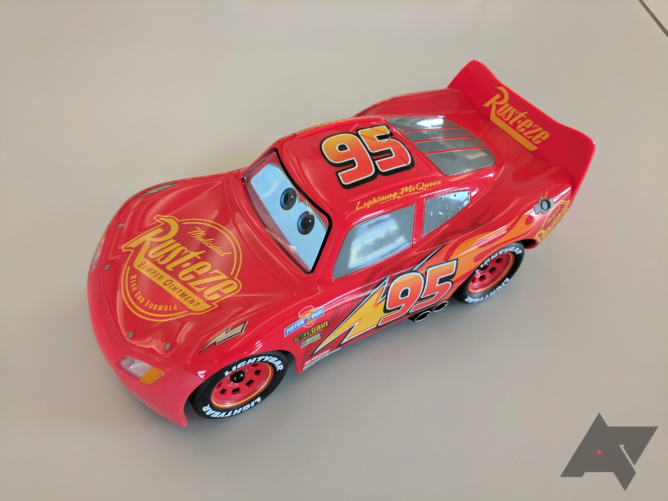 I tested this out with the first Cars movie, and to my surprise, Lightning actually did say something every once in a while, usually after a major scene. This is definitely a novelty, but it is kind of cool. Artem actually received a review unit as well, as he has a young son who I'd imagine is in Sphero's target demographic. Unfortunately, neither Russakovskii was able to play with the car at all. Despite clearing app data and re-downloading firmware updates multiple times, the car never got past the "Move Device Closer" prompt. In fact, his car even began randomly adding "D" to the end of things, like "Updating D" or "Move Device Closer D." Eventually, he just gave up, as there was really nothing more that could be done. Perhaps it's for the best, as the car is better-suited as a showpiece than an RC car, given its subpar driving dynamics. 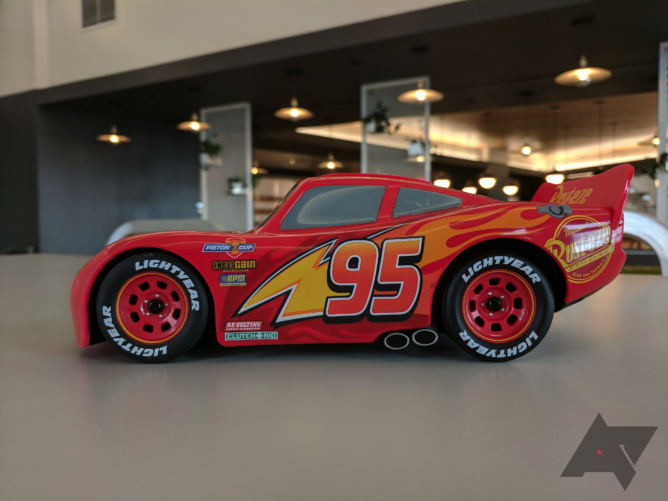 Sphero's Ultimate Lightning McQueen packs a lot of technology into a beloved movie character's body, but $300 would be too high a price even if it drove perfectly and had normal controls. 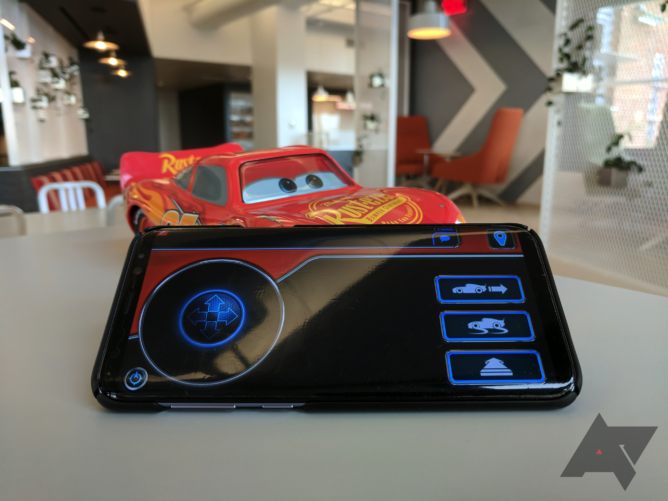 The product is caught in a bit of a catch-22; without the massive amount of tech inside, it wouldn't really be all that interesting, but Sphero's technical ambition has made it too expensive (and too slow), so very few people are probably going to actually buy one. I wanted to like this fancy little toy. I really did. But at the end of the day, it's just going to end up as a conversation piece between rich parents. After all, no sane adult would give their child a $300 toy car to play with when you can buy a $30 one from Target that does roughly the same things. I'm genuinely confused as to why this product exists. If you do want to pick one up, you can purchase one from Amazon or Sphero's official site for the princely sum of $299.99.